International customers must write us direct at udboss108@gmail.com to get current shipping charges. The herbs we use in this formula are the finest available worldwide. They are all grown to stringent Certified Organic standards or wildcrafted. This produces the most delicious and powerful herbal specimens. We then blend these high quality herbs in a vessel placed within an integrative wave generator, produced by the invocation of specific sacred geometrical forms. This further clears, energizes and balances all the herbal elements into their purest essence, each one at its own discreet frequency. This stabilizes the Merlin’s Herbal Magic Roots Elixir’s “bio-wave” on the seven frequencies which our bodies utilize for building integrity. Because of this, Merlin’s Herbal Magic Roots Elixir is able to awaken the awareness of this Living Integrative Wave within each of us. 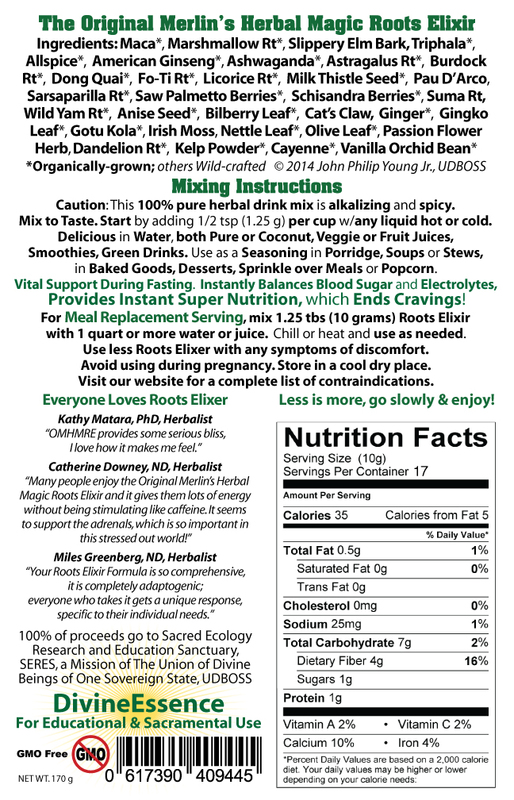 Caution: This 100% pure herbal drink mix is alkalizing and spicy. 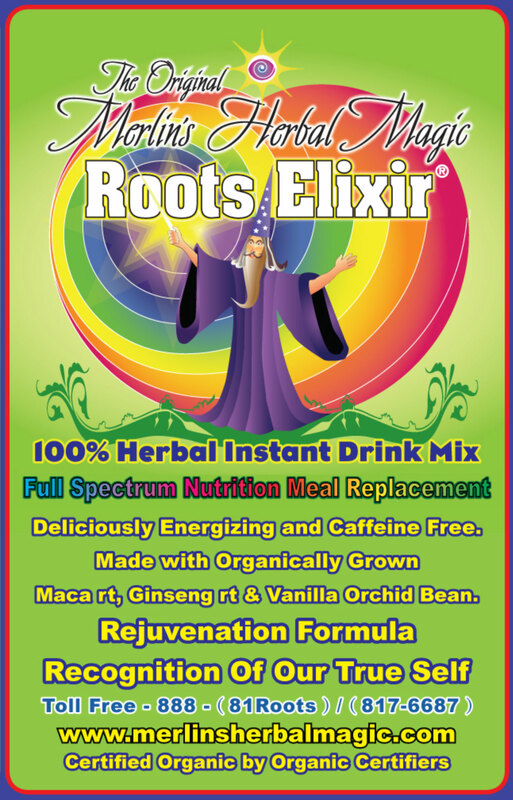 Start by adding 1/2 tsp of Merlin’s Herbal Magic Roots Elixir drink mix powder per cup with any liquid, or mix in 1 Qt. Fruit Juice, 1 tsp Roots Elixir Powder, 2 tsp lecithin granules and contents of one digestive enzyme capsule. This makes an elixir infusion that can be absorbed by the body more easily. Use 1 tsp – 2 Tbl daily, Roots Elixir Powder as desired. Avoid using during pregnancy. Reduce amount of Roots Elixir with an symptoms of discomfort. Less is more, go slowly and enjoy! One 170 gram Bag makes 210 one cup servings using 1/3 tsp and up to 250 cups of hot tea. connecting with all real things in nature, I realized another of my spiritual missions was to help humanity experience Oneness, through the sharing of this global blending of herbs. divine energy to share with all beings as a love letter from the Giver Of Divinessence, G.O.D. great blessings"